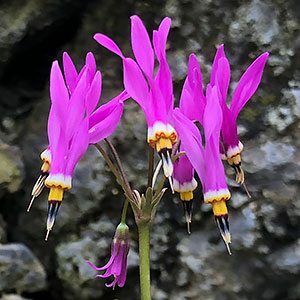 Dodecatheon meadia (shooting stars) is the best known of this genus of about 14 species, mainly from North America and Siberia. They are also known as the American cowslip and prairie pointer. Although they are sometimes referred to as ‘Shooting stars’ they are a member of the Primula family. These fascinating spring flowering plants could also be grown in pots in a shaded position. Flowers (shooting stars) appear on tall stalks 20 – 60 cm depending on species and conditions. Some species and cultivars have outstanding flowers, with actual flower colour varying from pale tones to stronger pinks. Look for ‘Queen Victoria’ (Dodecatheon meadia) which is pictured right, lovely cyclamen pink flowers during spring. 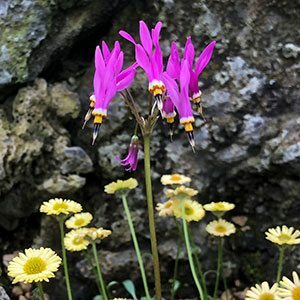 Dodecatheon or ‘shooting stars’, are a woodland plant and as such they do grow best in a filtered shade position in a humus rich well drained soil. pH 5 to 7. Keep plants moist, we recommend mulch around plants when they appear in spring for extra care. Botanical Name – Dodecatheon meadia. Common Name – Shooting Stars. Position – Best in afternoon shade. Soil – Humus rich and well drained – especially over winter. Height – To around 60 cm. Spread – To 30 cm. Flowers – Varying shades of pink to violet. Dodecatheon clevelandii is a great plant for partial shade in a well drained situation with a dry dormant summer period. Other popular Species include D. meadia, D. clevlandii var Insulare and D. hendersoni. How to grow ‘Shooting Stars’ Plants from seed. Shooting Star seeds are best sown in late autumn to early winter in a cold frame . Seeds can be stratified first by placing in a zip lock plastic bag in the refrigerator for 6 – 8 weeks. Some growers place the seeds on a barely damp paper towel in a zip lock bag in the refrigerator. We have found that these are not the easiest seed to germinate, so unless you are patient, go for established plants. Dodecatheon Plants (shooting star plants) and Bulbs are available for for sale from the following nurseries.